WiFi can be added to the chip via XR829 module or other wireless modules. The company provides Tina Linux and Android 8.1 for the processor. SLAM stands for Simultaneous Localization And Mapping, while VSLAM adds Visual to the acronym, and relies on images instead of lasers allowing for 3D mapping. 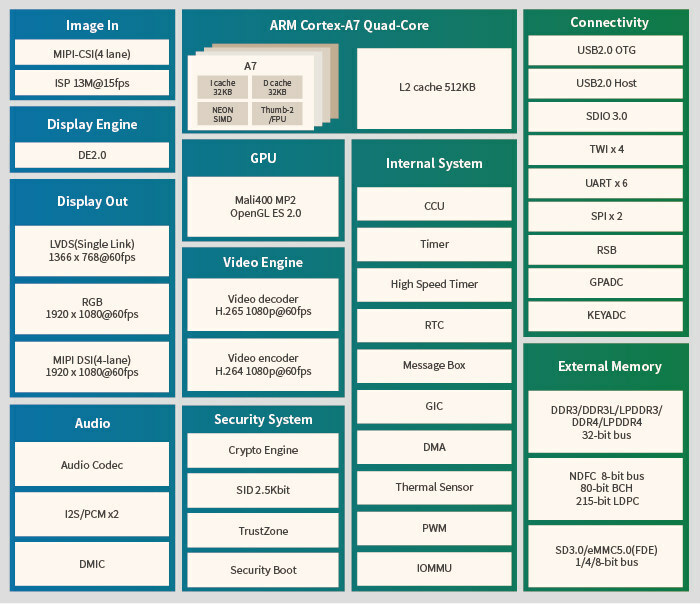 Allwinner is apparently still operating the company through 4 or 5 business units, where the same processor is used by various units under a different name and supported by a different SDK, because the product page for Allwinner MR133 appears to be filled with the exact same content as the product page for Allwinner R311, except the latter is designed for “intelligent voice interaction with screen, image recognition solutions”. Not sure where they are going with this. This is no AI acceleration. The Mali400 GPU is not capable of GPGPU so you aren’t doing AI on it. You can run AI on the A7 but it is not very fast, and you aren’t going to be processing 4K video with it. Unclear what this chip is targeted at. > Unclear what this chip is targeted at. Voice control cheap vacuum cleaner, child’s toys and toy robots? Then why does it need 4K sensor support and the ISP to process it? AW has some nice IP pieces but they sure aren’t stringing them together in useful ways. Looks like the same old IP they have kicking around rolled into yet another chip. “Did someone say a new buzzword? Better spin off a new version of an existing chip!” — seemingly every marketing person at Allwinner. I just went through the specs on every chip AW has listed on their website and I’m not interested in any of them. This splitting into business units is a bad idea, it may even kill the company. I’d guess AW is still being run by chip people, and like all chip people they don’t value software highly enough. I suspect they don’t want to spend money on anything new. They’ve got a bunch of TV box IP blocks and they are going to just keep slicing them up into new chips with different core configurations. They can’t compete with the high end smart phone stuff so it’s not worth them buying the best cores ARM has and designing a bunch of new or improved perpherials around them. If I was Allwinner I’d be using the stuff they have and the opensource community (linux-sunxi) to push out high volume chips that rivals the i.mx6ull on price. They have (crap) wireless IP so they could put out a complete WiSoC for Amazon Echo style smart devices. The camera support is good, but then there is no vision AI hardware that can make use of it. The A7 is simply too slow for running CNNs. 1) Replace the useless GPU with an AI CNN core. 2) Current ARM Trustzone, not this 10 year old DES stuff. IOT devices need protected SSL keys. The cypto core is too old and is designed for DES encryption. Current Trustzone supports the needed security features. 3) 100Mb Ethernet. 100MB Ethernet would turn this into a useful camera chip. They already own the current Trustzone and enet since it is in their other processors. >IOT devices need protected SSL keys. While I think that is true (more not putting keys in the same address space as your kernel, network stack etc) not many real world IoT devices actually do that. That is true because most IOT SOCs don’t have the necessary hardware. Every phone SOC has it. Every phone soc has the hardware but you can’t get a phone soc on a solder down module or a multichip BGA/LGA package with FCC etc certs for ~$10. The best you can get is a Cortex M3/4 or R4 with an SDK that supports some sort of encrypted boot up. After which all of your secrets are in the same address space as all of the firmware. Newer Cortex Ms have the trustzone stuff you want but will anyone use it? Vendor SDKs aren’t implementing basic stuff like marking the stacks and heap NX using the MPU so I don’t have much faith they’ll come up with a Trustzone enabled stack (Like ARM’s PSA) that will actually work. That’s why I think Allwinner could do something with the IP they already have but they seem to be obsessed with spinning the same smart TV SoC with HW video decoders over and over. You can use an external chip like Microchip ATECC508A to secure the SSL keys. But doing that adds $1 to each device. Yes, the combo AXPs show the fact. Both the Roborock AND the NES/SNES classic! Such versatility! With this new chip which definitely isn’t exactly the same as five of their other chips just with a different silkscreen, you’ll never be playing Mario Bros on your Roomba again!